Sloss & Carpenter Orthodontics is a premier orthodontic office in Centennial, CO staffed by board certified orthodontists Dr. Erin Sloss and Dr. Christopher Carpenter. Dr. Sloss reached out to us for a new website when her existing agreement with a far more expensive (What? Me? Take a shot at Televox?) website company came to a long overdue end. 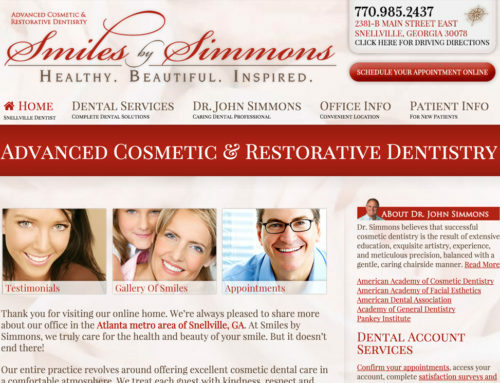 Dr. Sloss was looking for a mobile-ready, modern, clean and uncluttered design. She didn’t know exactly what she wanted but she knew she’d know it when she saw it. We’re happy to tell you that she loved what she saw! In addition to structuring a mobile-ready orthodontic website, we dug deep into the on-page SEO to ensure the practice is found in the highly competitive Denver market. We also took care of the support staff headshot photography with an in-house photo shoot. You all look great! The new website features fast and reliable managed WordPress hosting, weekly software patching, archives, and free content updates.